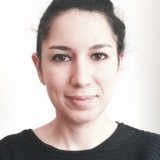 ZEYNEP AKSÖZ is a PhD Candidate at the University of Applied Arts in Vienna in Institute of Architecture (IoA) http://i-o-a.at/. She is working on EU funded Research Project Innochain http://innochain.net/. Her ongoing research topic is “Multiple Criteria Optimization in Early Design Phase”, where she focuses on the communication and integration of interdisciplinary information such as engineering performance, energy efficiency in the earlier design phases. Her main interest is developing interdisciplinary evaluation strategies and high performance simulation approximation methodologies. Zeynep received a Master of Architecture degree from Architectural Association London’s Emergent Technologies and Design Program where her research was framing evolutionary design methodologies in Architecture. She also holds a Master of Science degree from Technical University Vienna. Additional to her international experience in award-winning offices in USA and Europe she also has been teaching in several design workshops including AA Visiting School and AA Summer DLAB.